Is there more to this 47" LCD TV than an extra inch? Few brands know how to achieve shelf appeal as successfully as LG – a fact epitomised by the 47LH3000. 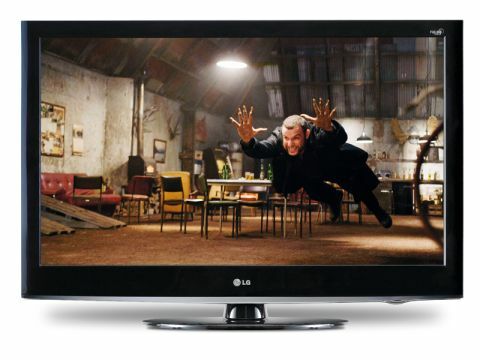 This is a TV offering glamorous looks and 47in picture kicks for just £800. A moment of disappointment sets in momentarily when you shift your view to the set's rear. The LG only manages three HDMIs. What's more, although it carries a USB port, this is only for service use, making the 47LH3000 unable to accept multimedia files from USB sticks or SD cards. Things look up again, though, with the discovery that the 47LH3000 manages a full HD resolution and decent 50,000:1 claimed contrast ratio despite its affordability. There's also a 24 Real Cinema mode for improving the fluidity of Blu-ray playback, and LG's multifaceted Twin XD Engine picture improvement system. It's a pity, perhaps the 47LH3000 lacks any 100Hz or similar processing for tackling motion. Clearly, something had to give to make the £800 price happen. Let's hope pictures don't end up being badly blighted by motion blur as a result. Despite the lack of 100Hz, the 47LH3000 is unusually flexible for what's ostensibly a budget TV. Its superbly designed onscreen menus contain picture tweaks galore, ranging from gamma adjustment to separate dynamic colour and contrast boosters and an edge enhancement system. If all this sounds far too complicated for your technophobic mind, though, don't worry: rather brilliantly, the 47LH3000 also carries a Picture Wizard, which guides you through a series of test signals to help you get pictures looking their best. If even that sounds too stressful, the set also provides you with a couple of ISF picture presets, so you could even call in the assistance of an Imaging Science Foundation engineer to calibrate the TV for you for best results. Not that you really have to try very hard to get surprisingly good picture quality out of this flatscreen. LG's traditional LCD strengths of extremely vivid colours and an aggressively bright delivery are very much to the fore, giving the picture an instant impact that immediately commands your attention. The 47LH3000 also surprises with the intense sharpness and clarity of its high-definition presentation and suffering considerably less than anticipated with motion blur, though there is still a little judder to contend with. The only real sign of the 47LH3000's relative cheapness comes from its black levels, which definitely look a bit bluer in tone than they do on any of our other more expensive sets today. But, by the standards of many budget rivals, the 47LH3000's black levels are quite respectable. We'd also urge you to be cautious with some of the set's settings. The Edge Enhancement tool, for instance, is a bit of a nightmare, tending to make pictures look gritty and stressed. Make sure you leave it turned off at all times. But with some reasonably punchy and well-rounded sonics keeping the unexpectedly fine pictures company, provided you show it a bit of TLC, the 47LH3000 is definitely one for the budget-conscious buyer to consider.